Although ‘pop’ is a very loose term (from the word ‘popular’), the common consensus is that pop music as we know it today derives from rock ’n’ roll music in the 1950s. Since then it has progressed through many phases and directions, often linked to a decade or period of time. Yet despite this massive variation there are many key trends adopted by the vast majority of pop tunes. These include relatively short length pieces (2-4 mins), repeated choruses and structures featuring repetition, simple drum grooves and ‘hooks’ – melodic lines or other musical features, designed to be as catchy and instantly recognisable as possible. 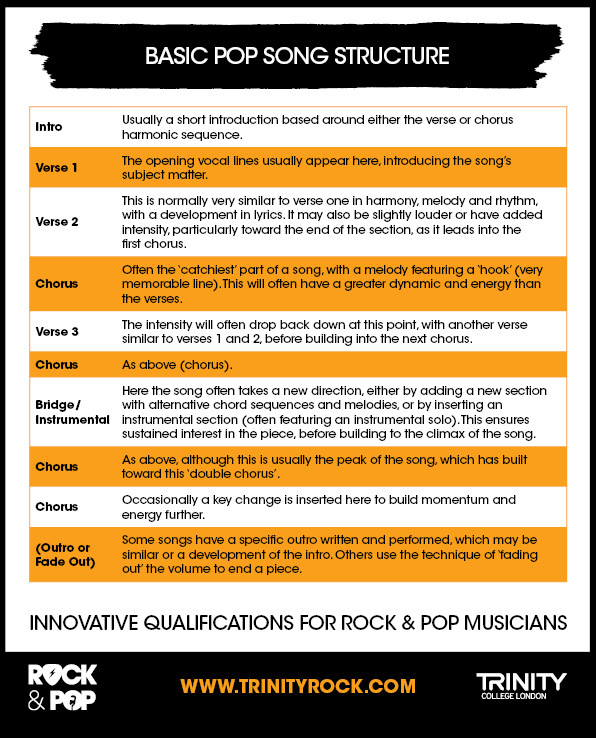 The basic pop song structure looks like the below, although variations (including added ‘pre-chorus’ sections) also often occur. The style is often influenced by other genres, such as rock, soul, Latin or dance, and has provided some of the biggest names in recent musical history, including Kylie Minogue, Robbie Williams, Michael Jackson and The Beatles. Despite being a broad genre with many variables depending on context, there are some common trends throughout the vast majority of pop songs and styles, which we can explore to create an idiomatic pop improvisation or accompaniment. For example, pop songs usually have simple structures with phrases or sections in groups of 4, 8 or 16 bars. Make sure you are aware of how long each part of the structure is so that you can shape your solo accordingly. For example, if you are playing over a repeated 16-bar chord sequence, you may wish to play a phrase for 4 bars, develop this for another 4 bars, play a different (but still related) phrase for the next 4 bars and then return to the original phrase for the last 4 bars. Or you may wish to end phrases in key points within the harmonic sequence, to create a big release of any tension built up throughout the improvisation. It is sometimes useful to remember that the style is catering to popular tastes, with many songs written for dancing, so try not to overcomplicate your ideas. Short, simple statements can be used to powerful effect when played with conviction and understanding of the style. Rhythmically, it is important to keep the momentum going, without coming across as being too aggressive. Try to tailor fill-ins or busy rhythmic patterns to the structure of the phrase or section you are playing. For example, drummers can use fill-ins as an effective way to give the piece a ‘lift’ into the next section, or to indicate the end of a section, by saving their fills for the last bar of the section. The Beatles are one of the most iconic pop bands the world has ever seen, taking the UK and the US popcharts by storm in the 1960s. With a plethora of hits including ‘Love Me Do’, ‘Sgt Pepper’s Lonely Hearts Club Band’ and ‘Yellow Submarine’, their musical and fashion style developed over their decade-long career. Starting out with a clean-cut, witty up-beat Brit-pop style, they moved towards a more hippie, psychedelic and experimental approach. To this day the band’s music is revered by millions around the world, with one of the key members, Sir Paul McCartney, still writing, recording and performing sell-out tours regularly. Often called the ‘King of Pop’, Michael Jackson first came to fame with his siblings, as part of The Jackson 5 in the 1960s, featuring on hits such as ‘I Want You Back’ (1969) and ‘Blame It On the Boogie’ (1978). He later began his solo career in 1971 and became one of the most prolific pop songwriters and performers ever. His 1982 album ‘Thriller’ is still the best-selling album of all time and he has countless hits under his belt. These include hits resulting from his legendary collaboration with Quincy Jones, such as ‘Rock With You’ and ‘Billie Jean’. More recent pop sensations include artists such as Britney Spears, whose debut single ‘…Baby One More Time’ reached number one in every European country it charted within in 1998. Her upbeat, commercially accessible style and youthful vibrancy was typical of the pop image of the late 1990s and early 2000s. More recent female pop singers such as Katy Perry, Jessie J and Pink have tried to shake off the ‘produced’ and manufactured image, instead appearing more independent and confident than their counterparts in the early 1990s. This can be seen in hits such as Beyoncé’s ‘Single Ladies (Put a Ring On It)’ or Christina Aguilera’s ‘Beautiful’.